2 months 2 weeks ago	- 2 months 2 weeks ago	#1497 by Pascale R.
Digitizing 3D 'donut' shape & overlapping dilemma was created by Pascale R.
I need help digitizing the numbers "00" in 3D foam for a cap. The zeros are both complex turning objects & I'm finding that where they come together, it overlaps too much. See the bunching? 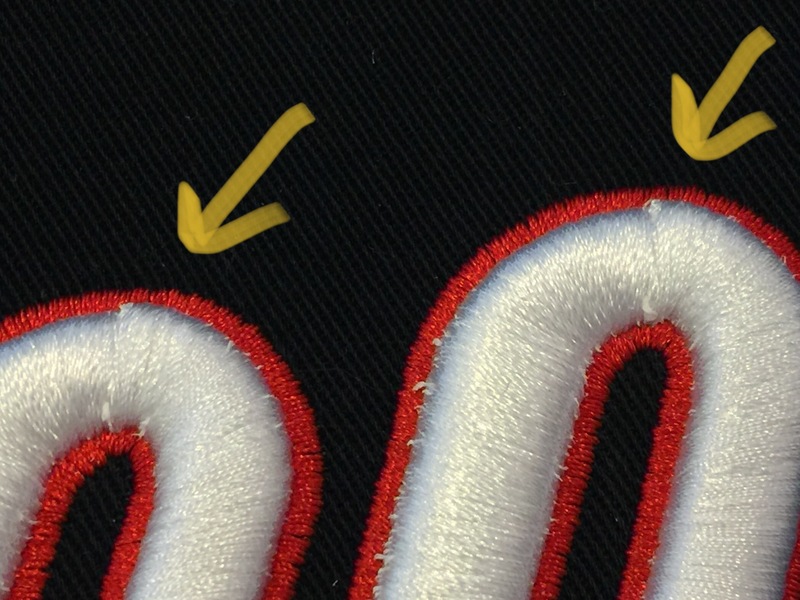 I presume it is because of the push effect from the dense (0.15) satin stitches. In either case, how much of a gap do I make? Also, in general I know for caps, one needs to digitize design from bottom up and from center out. How does one accomplish this with a donut shape? I look forward to hearing what you guys think. Thanks in advance! 2 months 2 weeks ago	- 2 months 2 weeks ago	#1507 by Pascale R.
As mentioned above, I used the knife to cut the white donuts. I readjusted the nodes so the stitches were perpendicular to the shape and created a little gap where the sections meet. I added the little section to cap off the opening in case I made the gap too wide & stitching didn't meet. On closer inspection, on both zeros, there is a little dip where the white sections meet, but there is no noticeable overlap or gap. Is this caused by the "cap" I digitized? As you can clearly see, the left zero (the one that stitched last) shifted to the left (it is not centered over the red background border). 3. Could stopping the machine & resuming 2 hours later have caused the misalignment? I had to turn the machine off for 2 hours after a few stitches of the first zero had sewn. This has been a fun project, but I'm not sure what changes I should attempt next. 1) For the sequence, it is necessary to adjust it to this way, red satin circle and followed by the "0" ring, to avoid shifting. 2) make the joint line at the side column of "0" ring. It should be relatively easier for machine to handle the joint at the straight column rather than at the curve column. 3) in the Properties of Fusion Fill object ("0" ring), change the value of "Rows" of "Overlaps" to zero. Previously, it is "1". The push-up effect will still happen in such shape, So, make it minimum. 2 months 2 weeks ago	#1526 by Pascale R.
Thank you Sam for taking a look at the file! I look forward to making your recommended changes. I'm out of test caps for now but can't wait to give it a try!